New from Tiger lawnmowers is the slightly smaller, but just as tough little brother of our recent petrol mower review and best in class Tiger TM5120SP, the TM4618SP. The name code pretty much sums up the spec of the mower which features a 46cm (or 18” if you prefer) all-steel deck and self-propelled drive which runs off a Briggs & Stratton 500E series 140cc engine. Designed to fill the demands of a market which is crying out for medium size mowers, the TM4618SP neatly slots into place to plug the gap between the smaller 14-16” deck machines and larger 20-23” deck machines. With the UK home owner’s garden, on average, fitting into the category of medium/small size, there is a need for a mower which Is big enough to get the lawn cut quickly and efficiently but small enough to fit into tight nooks and crannies as well as allowing for easy storage too…and we think this machine might just be the answer to these green-fingered prayers. looks to be larger than 18” due to its large wheels and sturdy frame build, as well as the Briggs & Stratton 500e engine which other mowers in a similar price range tend to lack, usually substituting for an OEM engine. The cutting deck is composed of a full steel body which felt strong and sturdy to the touch. Naturally we tried pressing hard on the body and shaking the machine and neither denting nor flexing of any kind seemed to be an issue with the deck. The handles felt solidly placed on the machine as well and even when forced, showed very little movement- a welcome feature especially on a machine at this price range. The collection bag is a hefty 60 litres and as well as collection the TM4618SP offers mulching and side discharge as standard. All in all, the build of the machine felt strong and secure. We wondered if the lack of larger rear wheels would cause issues in moving the mower across rougher terrain, but when tried on long grass and gravel, this wasn’t the case at all, in fact the double bearing wheels were easily pushed even when the self-propelled drive wasn’t engaged. Another impressive feature is the 8 selectable cutting deck heights allowing the mower to cut from 20mm to 80mm and all controlled from a single lever- not a bad feature for the Sub £250 category. The most important factor is obviously cutting performance, so we tried all three of the ‘3in1’ collection styles that the TM4618SP accommodates. Firstly, was bag collection. Bag collecting tends to be the go-to cutting method for most gardeners in the UK these days due to the neat finish it leaves, so getting this right, for us, is a huge factor. Put to the test the TM4618SP left a smooth finish on the lawn with very minimal grass residue left. We purposely left longer areas in the garden to test its ability to gather larger deposits of grass and the results were equally as impressive with next to no grass residue being left behind on the lawn. With the 8 selectable deck heights on the mower, it cut both the longer and shorter grass with ease leaving a very pleasant result, even taking down some of the daisies in the lawn which can be tricky for even high-end mowers. The mulching function on the mower is activated by simply placing the mulching plug into the deck discharge shoot, therefore no tools or levers needed. Testing on shorter areas of grass, the TM4618SP left a fine mulch, worked into the grass. For those who mulch regularly, the machines ease of ability to create a fine mulch led us to believe you’ll be happy with your choice. Finally the side discharge we tried on longer grass areas, due to the fact that most people would tend to either bag collect or mulch shorter areas of their lawn. The side shoot is simply set into place by lifting the flap on the side and appeared to work well, producing an even spread of grass discharge. However we didn’t test this mode extensively as we felt most people would be buying for one of the first two cutting styles. Coming with an expectation set fairly high from having tested the fantastic, larger 20” Tiger mower, the 18” Tiger did not disappoint. At a lower price point the Tiger TM4618SP has taken some of the best elements of its sibling and combined them into a smaller package which we believe suit the UK garden size perfectly. The 18” deck size allowed for a quick and effortless cut in the garden and left a superb finish, especially when using the bag collection feature. 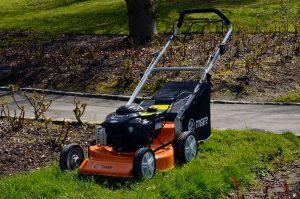 Boasting features such as 8 selectable cutting heights, 3 collection methods and a Briggs & Stratton engine, the TM4618SP had many attributes of a lawn mower costing twice if not three times its price. Currently sitting at £219 on Amazon, we feel this mower is a truly cost effective solution to your lawn mower needs which is high on performance and fantastic on value.